Last night I made a dinner as a belated birthday party for our friend Chris Bram. In typical fashion I made too much. The theme for the menu was small plates, I was feeling energetic and wanted to make a variety of dishes so we could nosh our way through the night. It’s a lovely idea until you realize you’ve been cooking and shopping for three days, your guests are about to arrive and you still haven’t made everything! In the end I guess 4 desserts was a tad over reaching, the chocolate cookies never got made. Our friend Debby, who used to be a pastry chef, commented that the chocolate crinkle cookies would have gone nicely with the Rum Raisin Ice Cream, somehow she managed to make do with Lemon Madeleine’s, Sour Cherry Almond Tart and ice cream as a palate cleanser. I love people with harty appetites ;-)I write all my menus on a chalkboard in the kitchen. It’s fun to write them and it’s also helpful for when I inevitably start going crazy 20 minutes before everyone is about to arrive, I take a deep breath, look at the board and remember what it is I still haven’t made yet. Which actually sometimes can make things worse, because then there is something else to do, but it’s better than forgetting altogether. Spicy olives and candied nuts were placed out for when people arrived. The nuts played double duty as they were also a garnish for the re-think of Waldorf Salad that would be served later. When everyone arrived we moved on to Singara Logs with Tamarind Chutney (made with tamarind, dates, peanuts, coconuts and Ajwain seeds which give it a wonderful funky tart sweet taste). Singara logs are a similar to Samosa only more flavorful and with coconut. Labor intensive, but worth it. The other thing that did not get made was the citrus salad. It was going to be a combo of Blood Orange, Cara Cara and Navel oranges topped with Arugula lightly dressed in a lemon vinaigrette and finished with a crumble of Ricotta salata. We managed to make do with just 2 salads. I’ll make it this week and report back. Both the Barley Salad and the Waldorf were hits, I’ll post recipes for them this week. 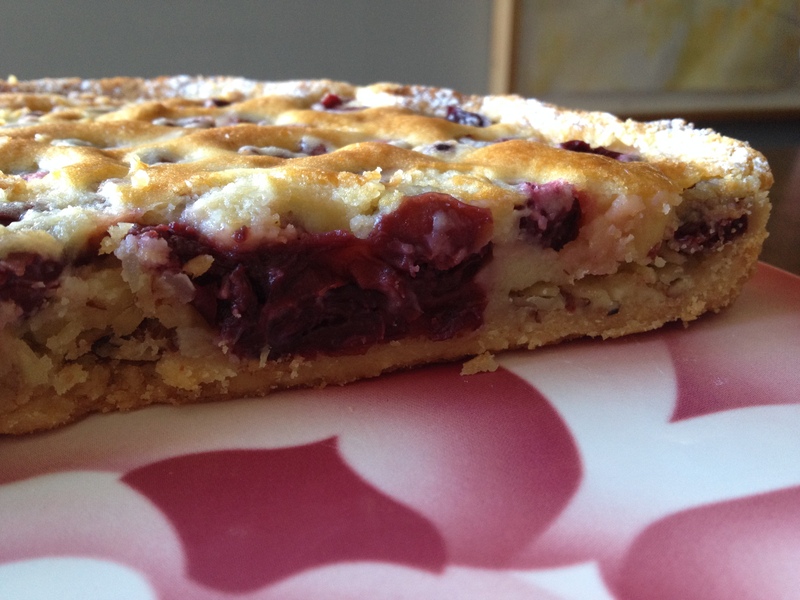 The Cherry Almond Tart, was my favorite item of the meal. It’s a variation on the Apricot Tart I posted a while back. I discovered a bag of sour cherries in the depths of my freezer I had pitted and froze when they were in season. It was easy to swap out the apricots and use sour cherries instead. The recipe calls for 1 1/4 pounds of fruit I was a little bit short so I opened up a jar of sour cherries to supplement the ones I had. They are softer and slightly sweeter than the ones I had, but worked just fine. My favorite comment of the night came from our friend Erin, who after finishing her slice of tart looked at me and said: This is definitely next level. It’s also very straightforward to make. So for your next dinner party give it a try, and Oh, if you do make it, really you don’t need to make anything else. It’s one of the rare desserts that I don’t even think needs whipped cream. And that’s saying something! 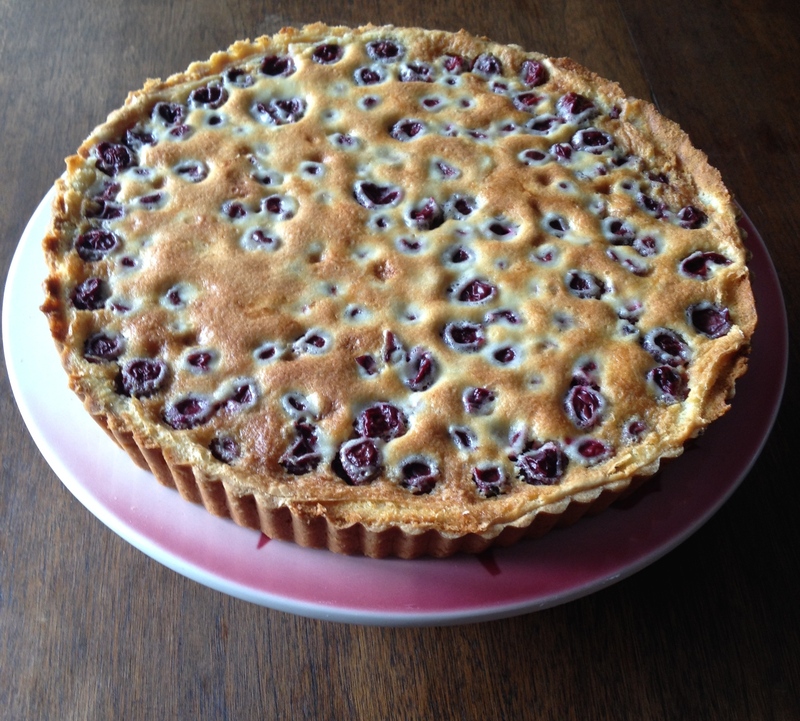 This entry was posted in Recipes and tagged Baking, chalkboard, cooking, Dessert, dinner menus, menus, Pastry, Sour Cherries, Sour Cherry Almond Tart. Bookmark the permalink.